Holy crossover, Batman! Or should I say: Holy crossover, Daredevil! If you had asked me to make 10 predictions about this finale, none of them would have been “a scene where a supporting character from Daredevil lectures Luke Cage about his love life.” I knew that Rosario Dawson’s Claire Temple—who played a fairly major role in a handful of Daredevil episodes—was designed as a crossover character for the whole Defenders universe. But I assumed Jessica Jones would sprinkle her in throughout the season, not have her take over their finale. Don’t get me wrong, Dawson’s wonderful here, perhaps even better than she was on Daredevil (and a much needed woman of color in this cast). She proves she’s a badass when she sticks a needle through Luke’s eye and she makes a great scene partner for Jessica because she’s equally straight-forward but much less self-loathing. However, it just feels weird to spend so much time with Claire when she’s played no role in the rest of the season. I can only imagine what it was like for those meeting the character for the first time. That’s one of the many things that made this finale feel a little anticlimactic. It doesn’t help that Jessica Jones got a little cuckoo for Cocoa Puffs in “AKA Sin Bin” and “AKA 1,000 Cuts” so anything was going to feel like a letdown after that high-stakes insanity. When the finale does try for shock value, it ends up pushing too hard. I think I was supposed to be horrified when an armless Albert woke up (I guess my theory about him faking his mind control was totally wrong), but my mind flashed to that scene in Walk Hard: The Dewey Cox Story where Dewey slices his brother with a machete (“Jessica, I’m cut in half pretty bad”). But outside of that unintentionally comedic moment, the rest of the finale mostly works for me. Kilgrave’s amped up ability to manipulate a whole hospital led to an exciting escape sequence for Jessica, even if it doesn’t mesh with the idea that Kilgrave’s powers are a virus (add that to the list of things I thought we’d learn more about). But by the time we got to the scene where Malcolm and Claire were discussing superheroism, I started to wonder if this finale had any kind of plan in mind. Then the dock scene happened. 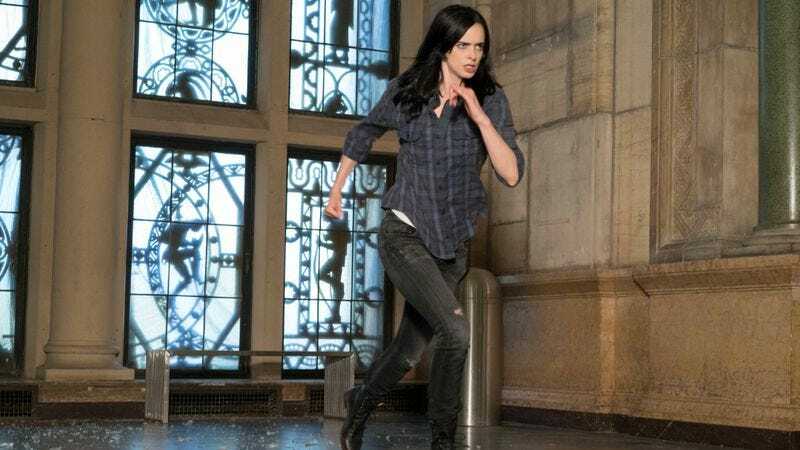 The final Jessica/Kilgrave confrontation is one of the best things Jessica Jones has done in this all-around excellent season of television. Krysten Ritter doesn’t telegraph whether or not she’s actually under Kilgrave’s spell while David Tennant lets just the right hint of frustration, desperation, and hope into Kilgrave’s confident speechifying. The whole thing was wonderfully tense—particularly once Trish got involved—and I kept pausing the episode because I was genuinely anxious about how it was all going to play out. This finale clearly has an eye to the future: Jessica’s dock heroism makes her a go-to savior for downtrodden New Yorkers, Malcolm steps up as her assistant (aww! ), and Trish presents the next overarching baddie for her to battle: IGH. Jessica hasn’t magically become a happier person now that Kilgrave’s dead and there are still plenty of stories to be told about our favorite superpowered anti-hero. But it’s kind of hard to imagine another season of this show without Kilgrave’s unique psychological threat and Tennant’s truly stunning performance. Still, this first season is more than strong enough to have earned my faith in a sophomore effort (assuming there is one, of course). Though there were weak spots along the way, standout episodes like ”AKA Ladies Night,” “AKA It’s Called Whiskey,” “AKA WWJD?,” and especially “AKA Take A Bloody Number” were some of the best TV I’ve seen in a long time. Stand out moment: That whole scene on the dock really is stunning, particularly when Jessica says her “I love you” to Trish and obviously when she tells Kilgrave to “smile.” But I’m going to give this one to Claire for that moment she realizes Luke Cage is gone and just casually drinks the water she was bringing him. Nothing phases that girl. Marvel Cinematic Universe connections: I was really holding out hope for a surprise cameo from Daredevil himself, but it was nice to see Claire again.